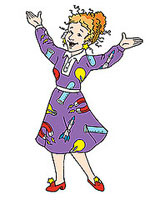 Have you ever had a teacher that you say has changed your life?…or maybe a teacher you compared to Miss Frizzle from The Magic School Bus? Well I have one such teacher in my past*. Let’s call her Miss K. (ps Miss K even looks a little like Miss Frizzle). After four years of having not gotten to talk to her I…well, talked to her. I had gotten her current number after meeting with a friend from the school I went to when I lived with my dad and called her that same day. It was awkward at first because I didn’t introduce myself until after I thoroughly apologized for calling so late. However, after we both got over the shock of finally getting to talk after all these years we started talking about books. I’m not sure if I told you all this before, but my Gila Bend education did not lead me to a whole lot of reading (except for some hard working and dedicated teachers that I had the pleasure of being taught by every now and then throughout my time in Gila Bend). I had always longed to be a book worm but I never really pushed it too hard on myself (mostly because I read a whole crap ton of newspaper comics). When I was in Miss K’s class she loaded us up with books, and for the first time I found myself with every spare moment I could manage greedily gluing my nose to the inside of a book. I even missed one of my bus stops by over 4 miles and ended up getting lost and having to walk about a mile to the nearest bus stop in the opposite direction…but that’s a story for another time. Point being, I was in heaven, and Miss K. was the angel of literary light. She was there for me in other ways, as well, but that’s all very personal and I’m not willing to get that close with you, internet. Anyway, Miss K. also had this 6th sense about finding books for her students. And, towards the end of the year, when our final projects were about to begin, she approached me with a very terrific book that she told me she had been saving for a student that could make it their own. This book was called Twenty-One Ballloons. It’s a marvelous tale that captured my imagination. And what’s more, the project was perfect for me to take my imagination and run with it. You know those books that are “field-guides” to fun things like wands, fairies, dragons and such. Well, Miss K’s final project was for us to make one of these based off the book of our choosing (except me…Miss K. had known this book would be perfect). If you read the book you will understand…in fact. If you read the book, email me and I will elaborate more on what I did. It was fun and very interactive. When you read a book, don’t just read it. Learn about the author and what they were doing when they wrote the book, comprehensively read the book, and ponder it…because authors are artists, and, like in paintings, every stroke/word is intentional. I would have more to say if I didn’t have so much to do tomorrow morning. Have a good night, all. *…not just one but this story is about one particular teacher and putting it in those words sounds more dramatic.